In its annual pre-holiday unveiling event, Apple Inc has announced the iPad Air its fifth-generation iPad, iPad Mini and MacBook Pro. 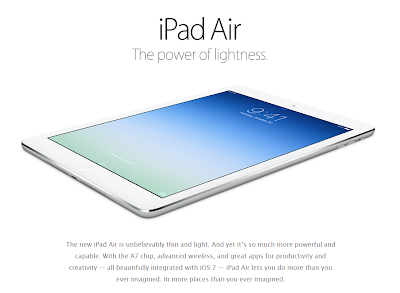 The iPad Air is Thinner and lighter with a powerful processor. The 9.7-inch Retina Display with other added features brings some design and performance enhancements to the best-selling tablet. The Touch ID finger print sensor is missing which would have been a great addition. A new A7 chip inside makes it 8 times faster than the iPad 4, according to Apple. This same 64-bit chip also in the iPhone 5S, the Air's A7 also comes with the M7 motion co-processor, which promises graphics that render at twice the rate of the previous iPad without sucking more juice than the previous gen. Though the slimness and weight are the two significant features, overall from my point of view it is a delicate high tech piece of junk. 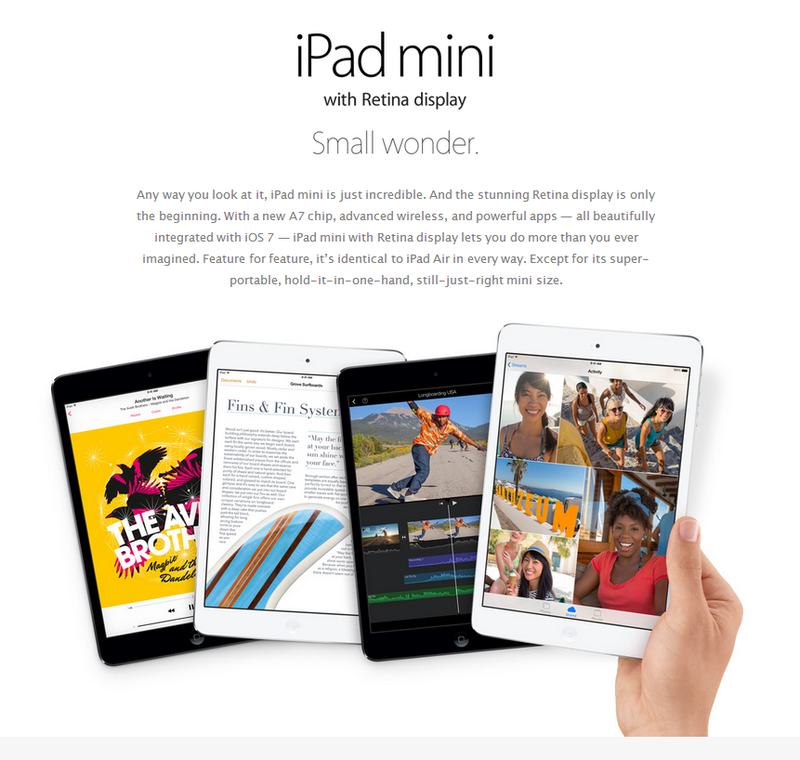 The iPad Mini has the same A7 processor as the iPhone 5S and iPad Air, packs in as many pixels as the Retina display on the full-size iPad Air. The new iPad Mini has a higher pixel density on its display than its big brother, at 326 pixels per inch. 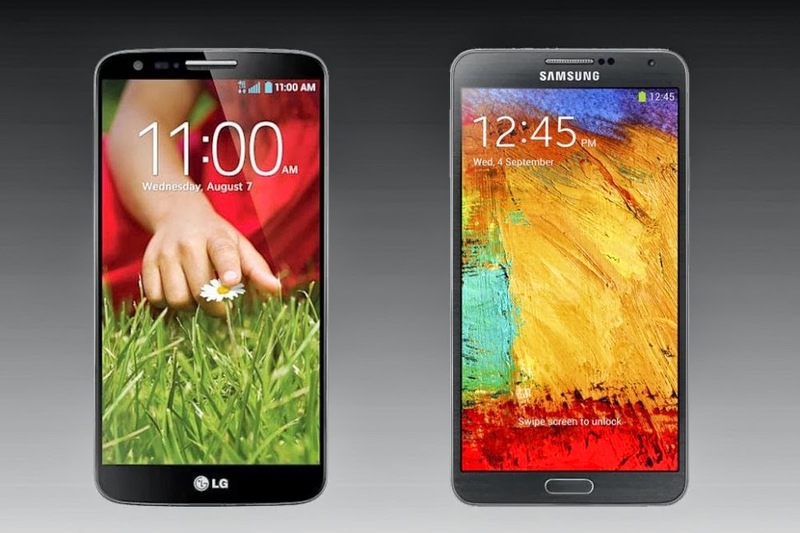 Can your eyes spot the difference at this form factor? Apple has boasted that the 7.9-inch Retina display on the iPad mini offers a 35 percent larger area than screens with 7-inch tablets. It is also the only small tablet to deliver Apple's full iOS ecosystem and App Store. The new Retina iPad mini features two antennas to support Multiple-In-Multiple-Out (MIMO) technology, bringing twice the Wi-Fi performance at 300Mbps. Cellular models also come with expanded LTE coverage to accommodate even more LTE networks worldwide, while continuing to deliver comprehensive support for other fast cellular technology around the world (DC-HSDPA, HSPA+), all in a single model. The new MacBook Pros have slimmed down for the 13-inch version, which is now only 0.71 inches thick. They got significant spec bumps, however, including new Haswell Core i5 and i7 processors and next-generation integrated graphics from Intel. Among others, both the 13- and 15-inch MacBook Pro models received PCIe-based flash storage with up to 60 percent faster read speeds than previous models. In addition, the laptops were brought in line with the MacBook Air lineup and now feature 802.11ac Wi-Fi connectivity. Battery life has been boosted as well, with the smaller model now lasting up to nine hours, while the 15-inch Pro can run for eight hours on a single charge. 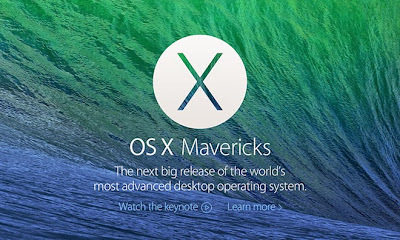 Finally, Apple has officially released its latest operating system, OS X Mavericks for free. Mac users can install it immediately. Here comes the festival season and there is no better time for fabulous electronics deals. 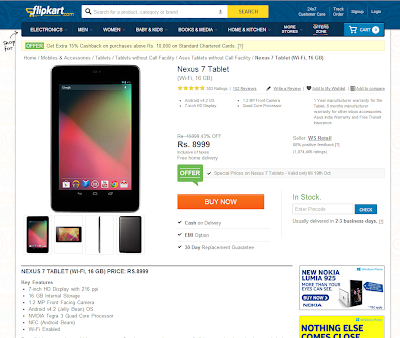 Nexus 7 is one such and the Indian retailer Flipkart is offering the Nexus 7 2012 version for just Rs 8999 and additional 15% off if you shop using your standard chartered credit card. The time is running out as the deal closes in less than half a day. Beautiful in a way the world has yet to see, Google captures the essence of all its expertise in technology and design in a tablet that is crafted to woo your heart and mind - the Nexus 7. With sharp images that change the way you will look at life, the 7 inch LCD IPS screen of the Nexus 7 with capacitive touch will transport you into another plane of clarity and brightness that adds a smoother dimension to everything that you use the tab for - be it playing your favorite game with amazing responsiveness from the tablet or reading the latest from your favorite author or even just chilling with a bit of jazz playing in the background - even videos come alive in full HD. With a pixel density of 216 ppi, the letters and photos are sharper and crisper than real print itself. The Google Nexus 7 discreetly packs an NVIDIA Tegra 3 Quad Core processor with four cores and a backup of 1 GB of RAM to blow your mind away regardless of what you are doing - from taking down a grocery list, to watching a favorite movie, to launching Zomato to find a new brunch place to even playing a graphic heavy game, life is super fast with the Nexus 7. With a simple design complemented by a slim body and bestowed with a massive battery backup of 8 whole hours, the wi-fi enabled Nexus 7 comes with enough juice to get you through the day - especially handy when it comes to long commutes or boring waits. With the latest Android v.4.2 Jelly Bean operating system powering the tablet, the Nexus 7 from Google grants you a smooth yet simple interface that you could easily get addicted to. You can also share the tablet with the entire family with individual settings for each person. What’s more, with the Play Store at your disposal, you will never be in need for any apps. A 1.2 megapixel camera with auto focus is what the Nexus 7 has on offer enabling you to capture every worthwhile moment with great clarity and perfection to relive when you feel like, later. The tablet also supports HD video recording that ensures that the best day of your life is captured and immortalized in the best possible way. Who says technology is not art? The Google Nexus 7 strives to prove otherwise. An idea for the festival season. 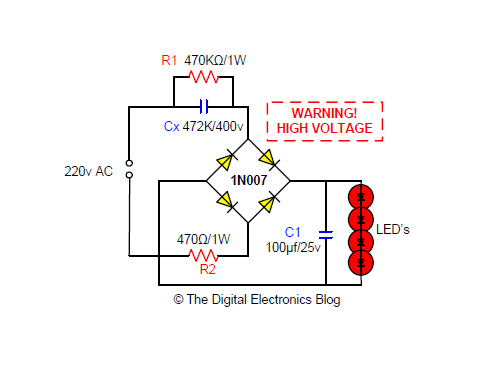 This basic circuit can be easily modified for 120v operation and more LEDs can be added as well. Please use extreme caution while handling this circuit since the mains is not isolated and so there is a risk of heavy electric shock. On the eve of the second anniversary of the passing of Apple co-founder Steve Jobs, CEO Tim Cook reflects on the moment in a company-wide email. Apple also has honored Jobs with a tribute video on its homepage. Please use this form for Advertising Information, Consulting Request, custom Technical Information Request, Career Tips (Career Counselling), Tech Talk Invitation, Solution to problems, Gadget Reviews, Report Broken Link, Site Errata, suggestions, concerns or any other sort of feedback. We do read and consider anonymous feedback, but it will be very helpful if you identify yourself. If you would like a response back, don't forget to leave your email. A Carbon Nanotube with its unique properties are a big breakthrough for electronics. Due to their thermal conductivity, mechanical and electrical properties, they find applications as additives to various structural materials. A team of Stanford engineers have taken this and built a basic computer harnessing the huge energy conservation capabilities and thereby promising to extend 'Moore's Law' for years to come. Intel co-founder Gordon Moore's 1965 prediction that computer circuitry will keep getting smaller and cheaper to produce has held up. But as integrated circuits (ICs) keep getting more densely populated with transistors, the large amounts of heat they dissipate have prompted concerns over whether silicon can be used for many more generations of transistor shrinkage. 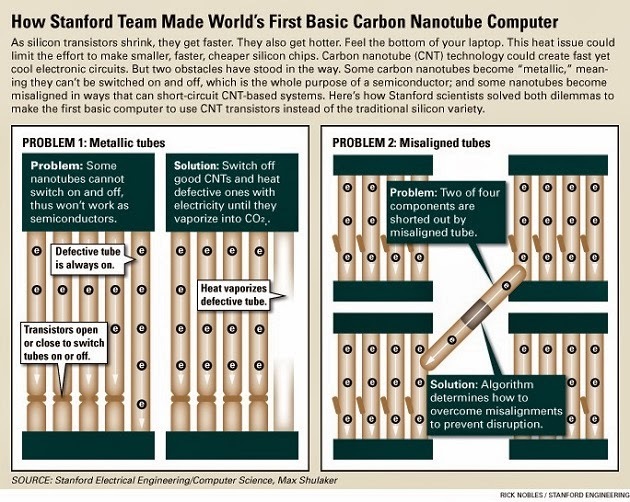 "People have been talking about a new era of carbon nanotube electronics moving beyond silicon. But there have been few demonstrations of complete digital systems using this exciting technology. Here is the proof," Mitra said in a statement. Mihail Roco, senior advisor for Nanotechnology at the National Science Foundation, called the Stanford work "an important, scientific breakthrough". The research was led by Stanford professors Subhasish Mitra and H.S. Philip Wong. RTL Synthesis is done by matching high level code against templates or patterns. It is important to use idioms that your synthesis tool recognizes. If you aren’t careful, you could write code that has the same behavior as one of the idioms, but which results in inefficient or incorrect hardware. Most synthesis tools agree on a large set of idioms, and will reliably generate hardware for these idioms. This post is based on the idioms that Synopsys, Xilinx, Altera, and Mentor Graphics are all able to synthesize. We consider combinational loops to be unsynthesizable. Although it is obviously possible to build a circuit with a combinational loop, in most cases the behaviour of such a circuit is undefined. Reason: In most implementation technologies, when a circuit powers up, the values on signals are completely random. Some FPGAs are an exception to this. For some FPGAs, when a chip is powered up, all flip flops will be ’0’. For other FPGAs, the initial values can be programmed. Reason: Delays through circuits are dependent upon both the circuit and its operating environment, particularly supply voltage and temperature. Reason: Processes with multiple wait statements are turned into finite state machines. The wait statements denote transitions between states. The target signals in the process are outputs of flip flops. Using different wait conditions would require the flip flops to use different clock signals at different times. Multiple clock signals for a single flip flop would be difficult to synthesize, inefficient to build, and fragile to operate. Reason: The idioms for synthesis tools generally expect just a single if rising edge statement in each process. The simpler the VHDL code is, the easier it is to synthesize hardware. Programmers of synthesis tools make idiomatic restrictions to make their jobs simpler. The if statement has a rising edge condition and an else clause (UNSYNTHESIZABLE). Reason: Generally, an if-then-else statement synthesizes to a multiplexer. The condition that is tested in the if-then-else becomes the select signal for the multiplexer. In an if rising edge with else, the select signal would need to detect a rising edge on clk, which isn’t feasible to synthesize. Reason: just an idiom of the synthesis tool. Some loop statements are synthesizable. For-loops in general are described in the VHDL cookbook by Ashenden. For the curious reader, the above code is an 8-bit serial-to-parallel converter. The signal d is the serial data and q is the parallel data. On each clock cycle, d is copied into one of the bits of q. For the synthesizable alternatives, please discuss/leave comments below. Your favorite blog, digitalelectronics.blogspot.com is now blog.digitalelectronics.co.in. Those who have already visited this blog since yesterday would have noticed a much simpler clutter free appearance while keeping the legacy features. We’ve refined the design and encapsulated the information accumulated over the years into an easily digestible and navigatable website. I am quite proud of it. In the coming months, i hope to improving this blog further so that it best serves you, the blog members. This is an archive of the Links and Resources from the electronics web community submitted here so far. Please add your own link using the form below, but be advised that non related (spam) links will not be entertained. hdlsnippets - Releveant and accurate HDL snippets in verilog, system verilog and VHDL. SysWip- For free open source SystemVerilog verification IPs. Intel and Acer have announced the Acer Liquid C1, an Android 4.0 smartphone at an event in Thailand. 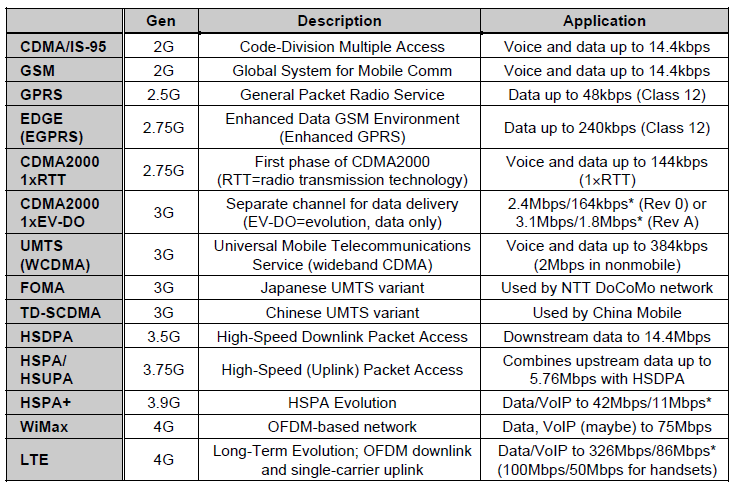 3G and 4G Wireless Blog: Quick Introduction to LTE-Advanced is an article written by Zahid Ghadialy where he explains LTE-A without going in technical details. This also includes the state of market on who is doing what. Read the full summary of Intel's Q4 results here and analyst estimates here. on Google Finance! Cover letter gets the recipient to read your resume, the resume gets you an interview and the interview gets you the job offer. If you are an Apple fan like i am, own an IOS device and are curious to know what the full list of features on the new IOS 5 are, then follow the hyperlink! You defined how products should be made and brought to the masses. You re-iterated that successful technologies are which deliver and refine user experience. openPICUS is an open source wireless platform that uses Wi-Fi and freeRTOS to connect things to the web. The guys from openpicus have released some new applications. One new feature is hibernation mode for lower energy use with battery-powered applications. 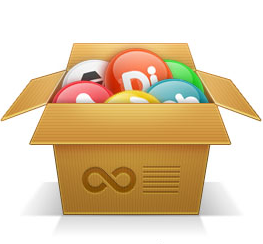 The other new feature is integration with ThingSpeak. The Inquirer reports that Ubiquisys has announced that it will develop WiFi base stations using Intel's processors. The intelligent base stations that Ubiquisys is developing are small cells for use in public spaces and big businesses. The need for Intel's processor comes from the growing need to have content within the principality of the base station rather than pulling everything off the internet. We are listed on EEWeb Site of the day - May 25, 2011. EEWeb is a premier electrical engineering community that strives to offer its members the best online resources for hardware designers. EEWeb is independently owned and operated by co-founders Cody Miller and Joe Wolin. The development of the site began in late 2007 and was released in late 2010. We have partnered with Digi-Key Corporation as an exclusive sponsor of EEWeb and we are proud to promote Digi-Key's first-class products and services. Augmentation is a technique used to produce a null CRC result, while preserving both the original data and the CRC checksum. In communication systems using cyclic redundancy checking, it would be desirable to obtain a null CRC result for each transmission, as the simplified verification will help to speed up the data handling. along with the modified data, but any data-handling advantage gained in the verification process is offset by the additional steps needed to recover the original data. added, both the original data and the checksum are preserved. In this example, our generator polynomial (x3 + x2 + 1 or 1101) is of degree 3, so the data (0xD6B5) is shifted to the left by three places or augmented by three zeros. 0xD6B5 = 1101011010110101 becomes 0x6B5A8 = 1101011010110101000. Note that the original data is still present within the augmented data. As discussed before, calculating the cyclic redundancy checksum for 0x6B5AD will result in a null checksum, simplifying the verification. What is less apparent is that the original data is still preserved intact. The degree of the remainder or cyclic redundancy checksum is always less than the degree of the generator polynomial. By augmenting the data with a number of zeros equivalent to the degree of the generator polynomial, we ensure that the addition of the checksum does not affect the augmented data. In any communications system using cyclic redundancy checking, the same generator polynomial will be used by both transmitting and receiving nodes to generate checksums and verify data. As the receiving node knows the degree of the generator polynomial, it is a simple task for it to verify the transmission by calculating the checksum and testing for zero, and then extract the data by discarding the last three bits. Thus augmentation preserves the data, while allowing a null cyclic redundancy checksum for faster verification and data handling. Will Intel's 3D transistor fuel a tablet fight with ARM? The electronic design automation (EDA) tool industry is big business, and commercial licenses are extremely expensive. Open standards have driven many proprietary EDA technologies to be publicly released as free/libre open source software (F/LOSS) and some have become IEEE standards. In this article, author Arthur Low reviews the history of key advances in ICs and EDA tools. The common theme presented in this article for the driver of technology innovation is the requirement to develop the most advanced microprocessor possible. Today, a low-cost, high-value-added business model can efficiently serve the market for IC subsystems licensed as intellectual property (silicon IP) in the form of compilable source code. Alternatively, for larger SoC designs, engineering budgets can be shifted from the purchase of a relatively small number of high-cost EDA tool licenses to open source EDA technologies that can be run on massive compute-server farms. The two business models are not theoretical, but realistic. The author explains how his company (Crack Semiconductor) developed commercially successful cryptographic silicon IP using entirely open source EDA technologies and how another company (SiCortex) pushed the limits of IC design and open source EDA tools by simulating and verifying a massively parallel supercomputer. Is Intel Really Rewriting Moore's Law With Atom? The Wall Street Journal is reporting that TI intends to buy National Semiconductor for $6.5 billion, $25/share. These two semiconductor firms are analog semiconductor powerhouses with large businesses in non-analog markets as well. TI says that this move will immediately grow National’s sales team by 10x. The article also states that TI has pulled out of the recession with a sharp rebound in orders while National Semi has not done as well. This apparently created a big acquisition opportunity for TI. The bid's hefty premium casts light on a large but unglamorous semiconductor business—chips based on analog technology and used for such duties as amplifying radio signals in cellphones and managing power consumption in computers.